How many accounts can be set up for an ORI? How do I set-up users on my account? How does the “Invite New User” functionality work? Why do I need to set-up users? As a local licensing authority user, will I have access to all the Form 212A submitted online? What happens to the Form 212A submitted online? How will I know which applications are pending for my ORI? What actions can I take for the pending requests? 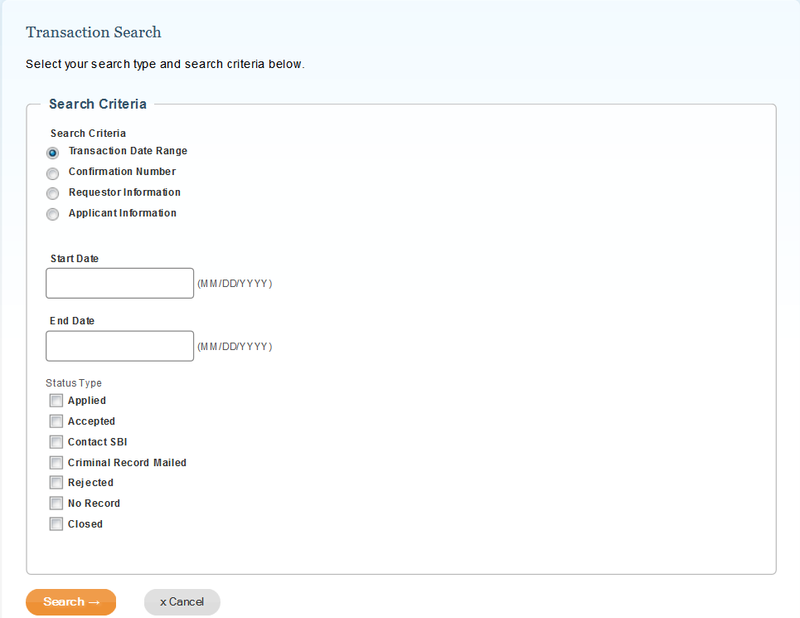 When can a CIU user process and update the status of an online request? What are the possible actions that CIU can take on a request? Is the local licensing authority notified when a request is processed by a CIU user? What is the “Contact SBI” queue for? What are the ‘Closed’ requests? What needs to be done for the requests which can’t be processed? Can I search for a request that may not be in a work queue? Can I print the yellow form for 212A? If you have questions about the ORI Number or Form 212A, contact the local licensing authority. Only one account can be set up per local licensing authority (ORI). There is, however, no limit on the number on the users that can be affiliated to an account. Account Administrator can initiate the process by sending an invite email to the user through the “Invite New User” link under “Manage Account” menu. The user will click on the link in the email and follow the steps to create the “Business User” account that will be associated to your account. The “Invite New User” provides notification to your employee that you would like to add them to your account. An email will be sent to your employee with a link that will walk them through the steps of setting up a “Business User” account that will be associated with your account. The link can only be used one-time. You cannot remove a user from your account but you can remove their access to a service. This will prevent them from accessing any aspect of the service. To remove access for a user, go to the “Administer Account Users” link. Select the user and remove all roles. You will have access to only those requests that were submitted for your ORI. All the forms submitted online get queued up in the ‘Pending Acceptance’ work queue for the concerned ORI’s. The requests are listed in chronological order with the oldest at the top. Below is the screenshot of the Pending Acceptance work queue. All applications which are pending acceptance with your ORI will be listed in the ‘Pending Acceptance’ queue. 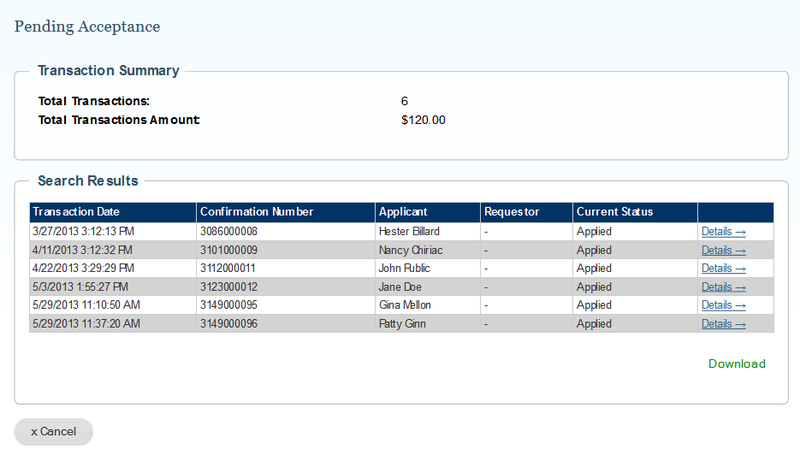 Save & Accept – to save any updates made to the Form 212A and set the status of the request to ‘Accepted’. It will move the request off Local PD’s ‘Pending Acceptance’ work queue and into the CIU unit’s work queue for further action. Save – This will only save any updates made to the Form 212A. However, the request will stay in the Local PD’s ‘Pending Acceptance’ work queue. Reject – This will remove the request from the work queue and an email will be sent to the applicant. Once a request is marked ‘Rejected’ no action can be taken on it through the service. A CIU user can process and update the status of a request only after it has been marked ‘Accepted’ by the concerned local licensing authority. An email is sent to the local licensing authority user who had accepted the request whenever the status is updated by a CIU user. All other users can login to their account and check the work queues. A CIU user marks a request with the status ‘Contact SBI’ if they need additional information from the concerned local licensing authority. All such requests with your ORI will be listed in this queue. You need to contact the State Police’s SBI / CIU at 609.882.2000 ext. 2918 for these requests. A CIU user can mark a request as ‘Closed’ along with the reason for marking it closed if they can’t process the request. All these requests will get queued in the ‘Closed’ queue so that the local licensing authority can view them and mark them as ‘Rejected’. A request which can’t be processed, whether it is because it has been allocated to wrong the ORI or there is insufficient information, needs to be marked as ‘Rejected’. Only the local licensing authority can mark a request as ‘Rejected’ along with the reason for rejection. The applicant is sent an email informing them when a request is marked ‘Rejected’. The reason for rejection is only for internal reference. The Transaction Search on date range allows application of filters based on request status. Below is the screenshot of the Transaction Search. Yes, Form 212A is available for print in the yellow form format through the PRINT button on the Transaction Details page, which can be accessed from both the work queues as well as the Transaction Search center.